These classic playing cards require NO color printing, laminating, or cutting (at least not on your part)! 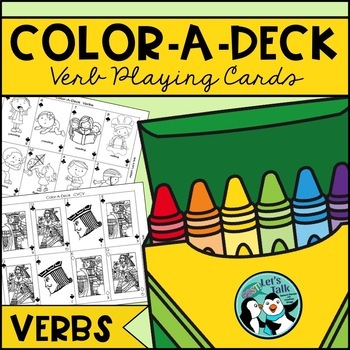 This download contains 1 complete 52-card deck for working on verbs, pronouns, and syntax. Print out 1 copy of a deck per student. 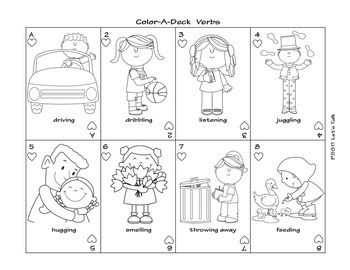 Have the students color and cut out their own deck of cards as either homework or an activity during your session. The students will then have their own personalized deck of playing cards that they can KEEP and take home for fun practice! My students enjoy playing War or Slapjack with these cards. 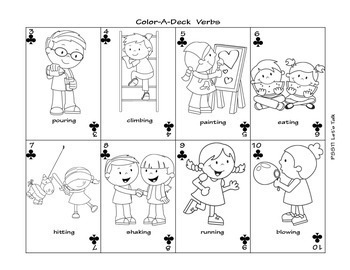 You could also print 2 copies per student if they want to use the cards for matching games or Go Fish. 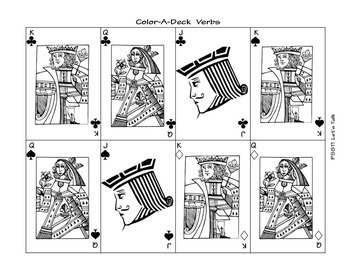 The deck contains 40 target verbs + King, Queen, and Jack cards in each suit.